In the Detailed user plans, you have the ability to capture line items on the invoices that you choose. This works if you have provided a good quality scan or a digitally created PDF. Optical quality is important for our OCR engine to reliably extract the invoice line item data. If you create line items manually, now you have a handy checksum, so it is easy to see if your numbers add up. Now the line items are extracted instantly! Select invoices where you need line items from the invoice list and click " Extract items", or switch to line items view when reviewing a particular invoice. If your folder is connected to cloud accounting, you can pair the invoice with your cloud accounting and export with one more click. Choose the " ledger account" for each of the invoice line items. When you select the ledger account for the first item, Datamolino will automatically select the same ledger account for all the items. Afterwards you can pick and choose different ledger accounts for each line item. Click "SAVE" when you are done. 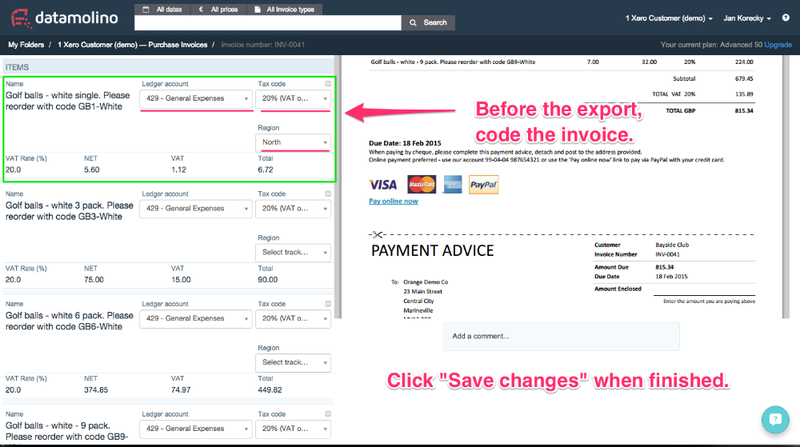 After you click save, click "EXPORT" to send the invoice to your cloud accounting. 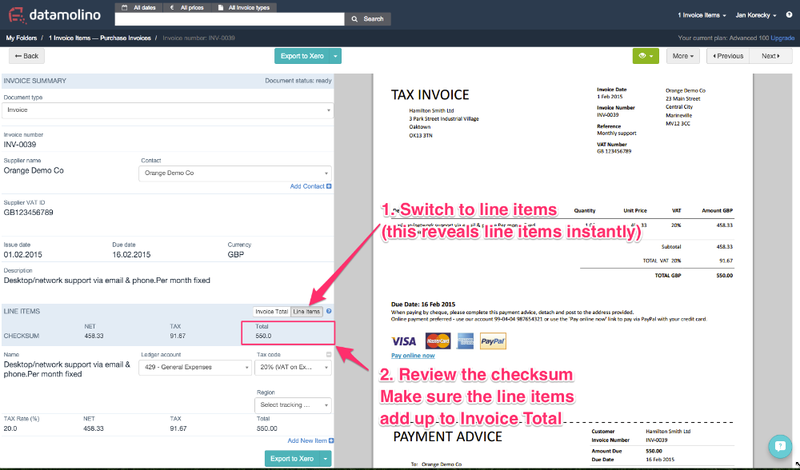 Then click on the arrow in the top right corner to review the next invoice or click "back" in the top left corner to go back to the list of invoices in the folder. What data is exported and how is the TAX calculated in my cloud accounting? Invoice without items: When you export the invoice when no line items are present, the TOTAL is sent as "tax inclusive", the TAX is calculated by your accounting software pursuant to the tax rate that you have chosen. Line items with NET value: When the line items on the original invoice contain only NET values, Datamolino captures these. Since the tax rate is not specified on the item level, only the NET value is extracted, the other fields remain blank in Datamolino. The NET value is sent to cloud accounting as "tax exclusive" and the TAX is calculated by your accounting software pursuant to the tax rate that you have chosen. Line items with TOTAL value: When the TOTAL line item value can be captured or calculated, this value is exported to cloud accounting as "tax inclusive" and the TAX is calculated by your accounting software pursuant to the tax rate that you have chosen. In general Datamolino exports the TOTAL of your invoice or line item and sends it to Xero as “tax inclusive”. Xero then calculates the taxes according to the tax rate that is chosen. Sending data as “tax inclusive” means that when you change the tax rate when editing your bill, the total amount on the line stays the same. For example, if line item with a quantity of 1 has a unit price of 100.00 with no sales tax, the unit price is 100.00 and the sales tax 0.00. If you edit the bill to 10% sales tax, the line item total remains at 100.00, but the unit amount changes to 90.91 and the tax to 9.09. When you need to EXTRACT LINE ITEMS there may be occasions where Datamolino does not find the TOTAL of the line item or cannot calculate the TOTAL (most invoices list line items as NET values, some lines do not contain tax rate as a percentage so Datamolino cannot calculate the TOTAL). In these cases Datamolino send the NET value of the line item to Xero as “tax exclusive”.